Read more about this book at http://www.heukemes.com/. Association Members receive 20% discount. Become a member of the Association! Get access to picture uploading, the member's only forum, the member's only website, and 20% Roger Bender Publishing. 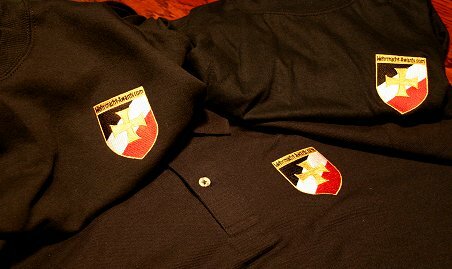 Polo Shirt: 100% Combed Cotton Heavy Gauge Pique Mesh Shortsleeve Polo Shirt. Soft fashion collar and banded sleeves. Two woodtone buttoned reinforced box placket. Various labels, but always the best quality. Sizes M-3XL. Color available: EK Iron Core Black. Tee Shirt: 100% Heavy Ringspun Combed Cotton Shortsleeve Tee. Hemmed sleeves, taped neck. Finest quality available! Fabric content may vary along with label, but always of the best construction and quality. Sizes M-3XL. Color available: EK Iron Core Black. Sweat Shirt - Heavy and comfortable sweatshirt with the same embroidered logo as the shirts above. Show your support for the forum and meet up with fellow members at shows by wearing the official forum cross. The pin measures one inch around and is gold plated with a black enamel center. 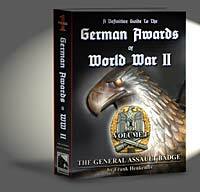 It features "Wehrmacht-Awards.com" through the middle arms and "Forum" "Member" on the high and low arms respectively. 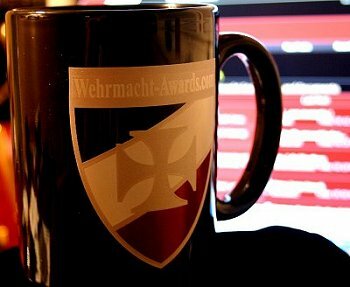 By popular demand, a Wehrmacht-Awards.com mug. A picture is worth 1,000 words, as you can see this heavy, 15oz mug is classy and tasteful. Memberships are non-refundable, other items will be refunded if returned in their original condition within 14 days.